In this latest InformationWeek Salary Survey, IT Pay has gone done for the first time in a decade. "After years of pay increases and multiple job offers, IT managers face an 8% decline in total compensation and IT staff a rollback of 11% from 2001, according to InformationWeek Research's 2002 National IT Salary Survey of more than 10,000 IT professionals." "Due to the unusually high volume for the IT Virtual Job Fair, all servers are busy at this time"
HTTP Error 403 - Due to the unusually high volume for the IT Virtual Job Fair, all servers are busy at this time. Please try again later. High Speed Rail for California? "Advocates of a California bullet train launched a campaign Tuesday to pass a $6 billion bond that would pay half the cost of the first phase of the high-speed rail" reported in this article. The state of California has a website for the California High-Speed Rail Authority - the the state board responsible for implementing the state's high speed rail system. (Notice the mandatory link to Gray Davis' Web Page). I have been doing some consulting work lately. I have added a page to my website with a description of my consulting services. K-logs, or klogs, are potentially a very useful knowledge management tool, according to this interview with John Robb of Userland. WriteTheWeb: What is a k-log? "Because of the advances in attack technology, a single attacker can relatively easily employ a large number of distributed systems to launch devastating attacks against a single victim. As the automation of deployment and the sophistication of attack tool management both increase, the asymmetric nature of the threat will continue to grow."  Moved link bar to right - gave it the title of "100 pixels"
Another posting about doughnuts - Krispy Kreme Wedding Cakes (sixth paragraph, second picture). Way cool French site for making your own techno music  le piano graphique  but warn your downstairs neighbors if you have a sub-woofer. NASA has an interesting page on their website  Astronomy Picture of the Day. The featured daily photographs are not only interesting but frequently quite beautiful as well. 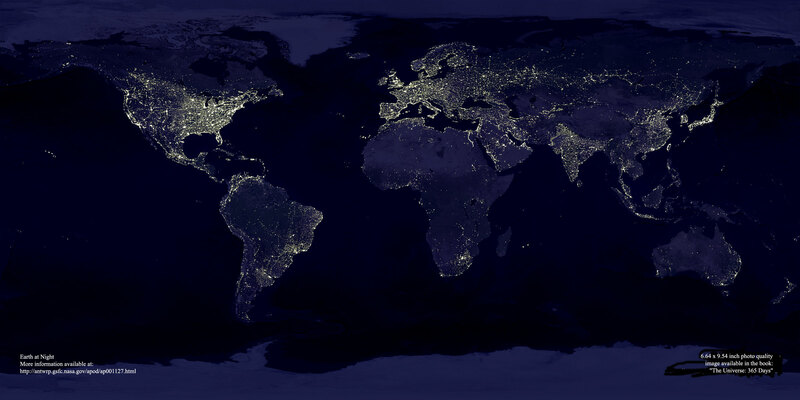 One the most interesting is this night photograph of the earth with lights indicating the population centers. It is a large photograph; you can scroll around to see different parts world. Certified Computer Document Imaging Architech! I am now a certified Computer Document Imaging Architect. This means that have have demonstrated that I possess the critical knowledge to plan, design and specify a document imaging system. 1:30 a.m. 1200 block of Ralston Ave. Belmont Police Station. A man in his 40s called Belmont police to say he had insomnia. According to a Belmont police report, he asked if he could stay the night at the station. He eventually came to the front lobby, but he was told to go home, which he apparently did. We just moved to Burlingame - so this news story of particular interest to me. A large fire in Burlingame destroyed a classic car shop, and burned the Little Man sign, which is familiar to anyone who has driven through Burlingame on 101.